These poetic, inspiring essays offer insights into the world of a gifted woman who was deaf and blind. 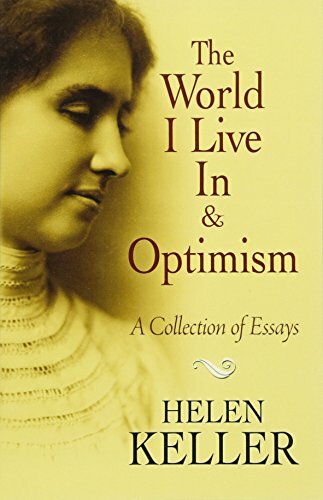 Helen Keller relates her impressions of life's beauty and promise, perceived through the sensations of touch, smell, and vibration, together with the workings of a powerful imagination. The World I Live In comprises fifteen essays and a poem, "A Chant of Darkness," all of which originally appeared in The Century Magazine. These brief articles include "The Seeing Hand," "The Hands of Others," "The Power of Touch," "The Finer Vibrations," "Smell, the Fallen Angel" "Inward Visions," and other essays. "Optimism," written while Keller was a college student, offers eloquent observations on acquiring and maintaining a sense of happiness. These essays reflect the author's remarkable achievements, as expressed in her honorary degree from Harvard, the first ever granted to a woman: "From a still, dark world she has brought us light and sound; our lives are richer for her faith and her example." About: These poetic, inspiring essays offer insights into the world of a gifted woman who was deaf and blind.